I’m sure you’re all more or less familiar with the popular Californian pop-punk band blink-182. I’m less sure on whether you’re aware of the fact that its bass player is called Mark Hoppus, is aged 43, and besides making seats vibrate he’s also a singer – sometimes producer – as well as a quite successful entrepreneur. Yes, because a part of his musical activity Mark is also the founder and owner of – surprise, surprise! – Hi My Name Is Mark (HMNIM), a company established in 2012 and self-described as: “a group of like-minded friends who are equally passionate about making great clothes, awesome art, cool objects, and unique pieces. We set out to make great things together and work with people and brands who share our aesthetic and sense of humor”. While the label HMNIM itself was already buzzing around even before 2012 – for instance, I remember a series of iTunes podcasts with that name revolving around the music industry and various scenes hosted by Mark himself around 2006-2007 – it wasn’t until the last couple of years that the brand really established itself and definitely took off. In fact, something that’s really cool about the company is that they do not limit themselves to the selling of fine clothing pieces (some of which I’ve already purchased, they’re rad), but they’re also always coming up with great collaborations offering, amongst others, watches, visual prints, playing cards and thermos bottles. To have an idea of what it is exactly I’m referring to, just take a look at this. “What’s up with the octopus? I’ve been using the octopus logo over the past few years, and throughout, people have asked, ‘What’s up with the octopus?’ It’s an easy answer. Music. Friends. Art. Travel. Adventure. Quotes from your favorite movies. The ocean. Punk rock clubs. Video games. Websites that make you laugh. Literature. Photos of good memories. London, Los Angeles, New York, and everywhere in between”. Well, I personally think that not only this is a pretty clear explanation, but also that Mark is doing something quite unique and I gotta say I like and endorse it a lot. To have such a great amount of different artistic sources of inspiration reunited onto a single website is certainly something I haven’t find so often on the Interweb. Clearly, Mark’s been able to exploit his halfway celebrity-status to count on a decent fanbase from the beginning, but nonetheless you can really tell he believes in what he’s putting forward and this, after all, remains the main positive factor driving this project. Probably my favourite part of the brand is its blog, which includes regular visual updates, audio files, and a re-launched HMNIM podcasts series, that so far has hosted guest appearances who go by the names of Alex Gaskarth and Jack Barakat of All Time Low and Tom DeLonge’s new replacement in blink-182 Matt Skiba (by the way, I suggest you take a listen to that specific episode if you need some calm after the storm of their recent line-up controversy). It’s precisely the podcasts that make me really happy, mainly because I think Mark is extremely brilliant at hosting guests from the art world in general (incidentally, he also had his own TV talk show on Fuse called “Hoppus on Music” from 2010 to 2012, just to show people he’s also good at doing it in front of a camera, certainly not to be taken for granted for a punk-rock bassist), but also because the topics handled during them are really interesting. And he’s got an irresistible laugh: everytime he laughs I just go along, I can’t avoid doing it, and it’s pretty fun, you should check it out. 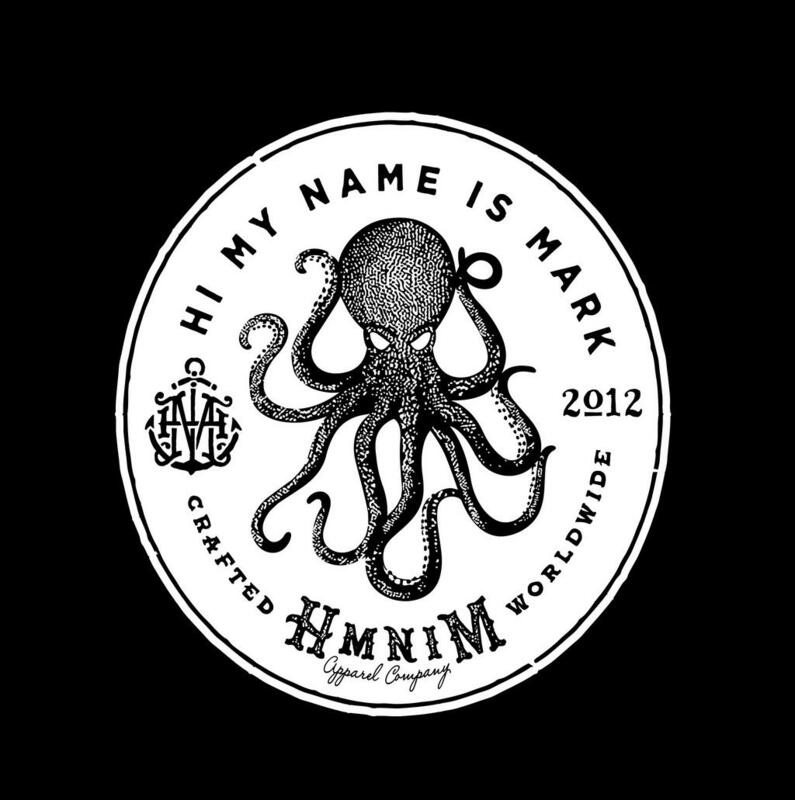 Yet, HMNIM is not only Mark Hoppus, there are a number of additional great personalities involved in the project, of whom you can all find out more directly on each artist’s personal bio on their website. So, don’t get fooled or somehow deceived by the company’s name: his name is certainly Mark, but he’s just one brick in a wall of inspiring artistic content made available to everyone thanks to great dedication, exciting collaborations, and fine production amongst a group of friends. What more could we allow ourselves asking for?